Thousands of children in homes across Eastern Washington and North Idaho are unwrapping new toys this morning because of the Christmas Bureau, which is supported by the generosity of hundreds of area residents and businesses. This tradition has continued since 1945, and giving to the Christmas Bureau is an annual tradition for many. Each donor, no matter how large or small the gift they give, is important to pulling off this fantastic effort every year. It’s not just Spokane and Kootenai County residents who have come through this year. There have been donations from Newport, Ephrata, Priest River, Oakesdale, Sandpoint, Seattle, Kennewick and even Arizona. 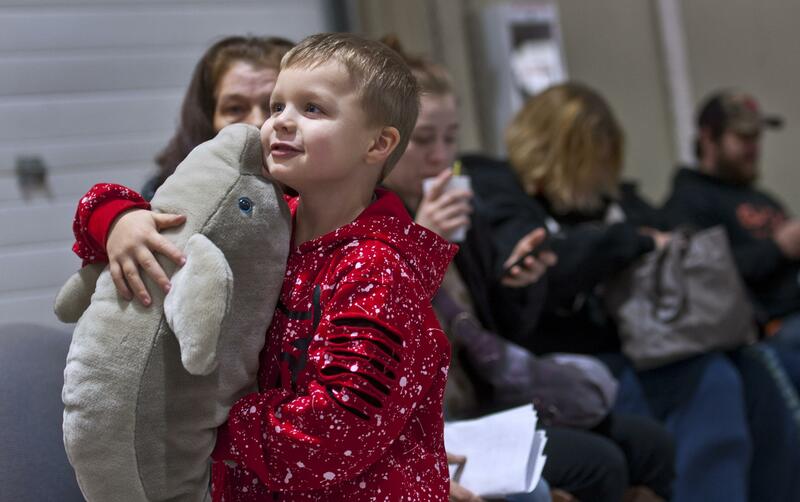 The goal of raising $525,000 to pay for the food vouchers, toys and books given out at the Christmas Bureau is tantalizingly close, but we haven’t made it yet. New donations of $28,137 have brought us to a total of $493,819.84, which is $31,180 short. But there’s still time to make a difference. PayPal donations must be made by Tuesday to allow time for processing, and donations by check must arrive by Wednesday. Any donations received after that will be credited toward the 2018 Christmas Bureau. We have managed to meet the donation goal for the past 12 years. With the community’s help, we can make it happen this year, too. The total amount raised will be revealed in a story on New Year’s Day. Huppin’s donated $5,714. “Contributing to The Spokesman-Review Christmas Fund is a long-standing tradition for the owners and employees of Huppin’s and OneCall.com (our online division),” wrote company President Murray Huppin. “It is a privilege for us to share our blessings and add to the warmth and spirit of our community. Colvico Inc. of Spokane donated $2,000. Glenn Breen, of Spokane, donated $1,001. The Slater family gave $1,000, as did an anonymous donor from Hayden, Idaho. Jeff and Kim Brown, of Mead, donated $1,000 in memory of their parents, Helen and Thomas Busch and Bud and Jane Brown. “Thank you for all you do for others,” they wrote. The physicians of Providence Spokane Cardiology donated $500 “in memory of Dr. Tim Bishop, our friend and colleague.” Mike Mikos, of Spokane Valley, gave $500, as did Ruth Cummings, of Spokane. An anonymous Spokane donor sent $500. Sharon Powell, of Spokane, gave $500 “to one of the best causes in town.” Fred and Sharon Clark, of Chattaroy, sent $400. The Spokane branch of Morgan Stanley donated $300. Les and Patti Whitbeck, of Liberty Lake, gave $300. Elizabeth and Robert Lemoine, of Spokane, contributed $300, as did Dennis Hughes, of Deer Park. Virginia Schneidmiller, of St. John, Washington, donated $300. Robert and Marian Cummings, of Spokane, gave $300. “We have been blessed through the years, and may a few of these blessings be passed onward,” they wrote. Jesse Zumbro gave $160. M. Haynes, of Spokane, contributed $150. Jim English, of Colville, donated $120. Brian and Julie Mitchell, of Spokane, gave $100. Charles Kogler and Ann Shaw each donated $100. Richard and Judith Gammon, of Spokane, sent $100. Sheryl Ossello gave $100 on behalf of Kathy Ossello. An anonymous Colbert donor contributed $100. Armstrong & O’Brien in Spokane donated $100, as did an anonymous Spokane donor. Robert and Donna Syron, of Clayton, Washington, sent $100. “Thank you for what you do,” they wrote. Robert and Katharine Heskett, of Greenacres, donated $100 in memory of Father Frank Bach, a longtime Christmas Bureau volunteer. Beverly and Randy Masteller, of Spokane, contributed $100, as did George and Elise Bozzo, of Veradale. An anonymous Spokane donor gave $100 in memory of Father Frank Bach. Jarold and Nadine Cartwright, of Spokane, gave $100 in remembrance of Chuck Naccarato and Terry Lackie. Mike and Vic Roberts, of Kennewick, donated $60 in the name of Bonita Roberts. An anonymous Spokane donor gave $50. Rick Hayes, of Elk, donated $50. Marilyn and William Thordarson, of Spokane, sent $50. “Special blessings to all the volunteers who are spending their days at the Bureau bringing joy to families!” they wrote. Cleve and Brit Penberthy, of Spokane, gave $50, as did Richard and Claudia Kroll, of Nine Mile Falls. Kirsten Schierman donated $25 “in honor of Great Mae, who loved to give gifts.” Nancy and Barry Bauchwitz, of Spokane Valley, gave $25. Colleen Daniel, of Spokane, gave $20. Bill and Kathy Hansen, of Liberty Lake, contributed $15. For donations made on PayPal, the S-R contributed the processing fee.